A fun sock in 4 sizes (children, women, men, and Christmas Stocking), worked in red, white, and green gansey (or firm sport weight) yarn. 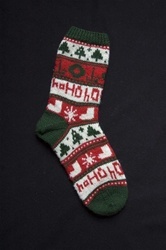 Bands of 2-color patterns adorn this sock with motifs of Christmas trees, wreaths, candles, snowflakes and more! Instructions included for a heel which is worked after the sock is finished. The gauge is 7 sts/inch for the first three sizes, 6.5 sts/inch for the Christmas stocking. Intermediate. Beth Brown Reinsel is an expert on Scandanavian and other traditional knitting techniques. All of her patterns include not only clear instructions but also charts, schematics, glossary and bibliography. Every pattern also contains mini technique lessons.